Looking for a Lake Tahoe wine tasting adventure? Experience the beauty of Lake Tahoe during one of our 2-hour, small group, semi-private tours, while tasting Northern California’s great wines, or customize your own booking to celebrate that special moment in your life! Our midday Cruise starts at 11am, operating Thursday through Sunday and our Sunset Cruise starts at 6pm, operating Thursday through Sunday. Sunset cruises will depart at 6:30pm May – July, 6pm in August, 5:30pm in September and 4:30pm in October, due to earlier sunset times throughout the season. Both tours are approximately two hours in length. 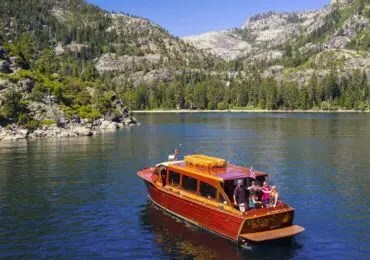 Tours will be aboard the beautiful “Golden Rose,” a one-of-a-kind 1953 Chris Craft Venetian Water Taxi and will begin at the Tahoe Keys Marina in South Lake Tahoe, California circling Emerald Bay. Throughout the tour, we will be sampling 8 wines from various wine regions in Northern California. Guests will have the opportunity to purchase bottles of their favorite wines at the end of the tour to enjoy during the rest of their stay in Lake Tahoe or to take home to add to their collection. A designated driver/non-drinking rate is also offered on most tours. If you do not have a designated driver, please arrange for a taxi by calling (530) 543-0330. Uber and Lyft are also available through their smartphone apps. If you’re a first time user of Lyft click here for up to $50 in free ride credits, first time users of Uber, click here for a discounted fare of up to $20 off. If you’d like to hire a car service instead, please contact Tahoe Elite (530) 582-5828. Visit our Reservations page to book your tour today!